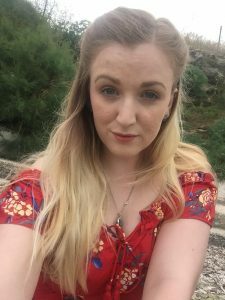 You may have read my blog a couple of weeks ago about how I recently got married and I did this abroad in sunny Greece. 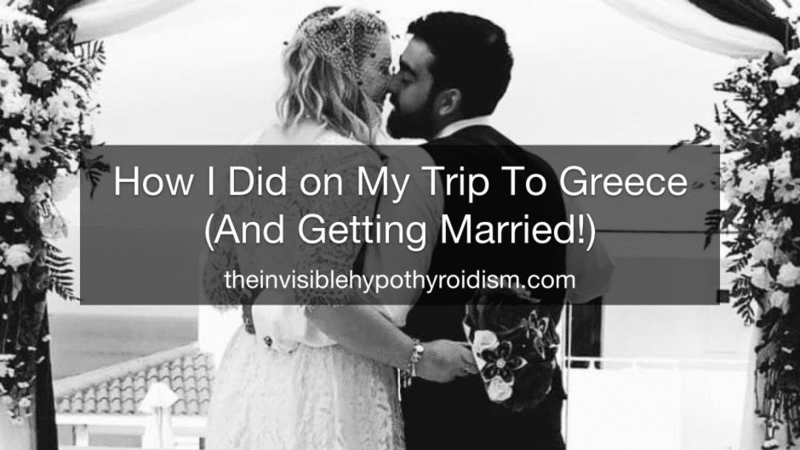 We spent a week there, tying the knot towards the end of our trip and I wanted to cover how I coped managing my health on holiday, in a foreign country, with glutenous food and more. My last trip away in December to Frankfurt surprisingly went very well, despite the trip to Morocco before that not going too well for my health at all. So I was wondering which way my health would go for this trip! We had a 12 hour journey door to door, which included leaving the house for the airport at 1am with no sleep beforehand, so that was interesting! I rely hugely on good sleep and without it my brain and body starts to shut down pretty quickly. This became evident by about 4am, after the adrenaline and excitement was beginning to wear off and I just wanted to get on that plane and get to the hotel so I could nap. Sat in the airport waiting for our 6am flight, my brain was shutting down big time and as I looked around me, it felt as if everything was moving double speed and I was in slow motion. I did perk up, but then crashed again by the time we got on the plane and this cycle of feeling a bit better and then crashing carried on until we were eventually able to get some sleep after being awake for pushing 48 hours! It was torture for someone who relies on a good sleep routine to function. By the next day though, I was feeling a lot better and so my body seemed to recuperate fairly quickly. As we were running around the island finalising the last details for our big day, I didn’t struggle to cope at all and I barely thought about my health. It didn’t seem to get in the way. It was warm in Greece, but I wouldn’t say hot. Temperatures were around 21 to 26 degrees celsius which is actually ideal for me because I’m nice and warm but not so hot that I can’t function! With my thyroid problems, I’ve never been able to regulate my body temperature very well. In terms of being gluten-free, it wasn’t very difficult. The hotel we stayed at didn’t have the best selection of gluten-free food, meaning that I ate a lot of the same kind of salads and ice cream every day, and couldn’t try the meats, curries or more substantial food, but I always pack some gluten-free food just in case to keep me going. Energy bars, nuts and seeds are all vital to make sure I always have something to nibble on! 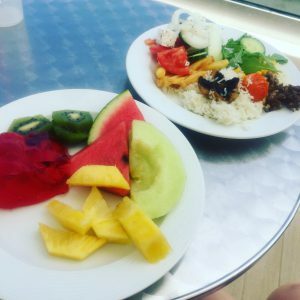 Eating out of the hotel was easier as I could select what I wanted from a menu and getting a good piece of chicken with salad and fries for example, safely cooked in its own oil (not contaminated with gluten) was simple. I enjoyed eating the meats and salads especially. My acne, which has been very up and down recently, also got better as the week went on, and I didn’t have many new spots come up at all. The sunshine and Mediterranean diet definitely seemed to help! 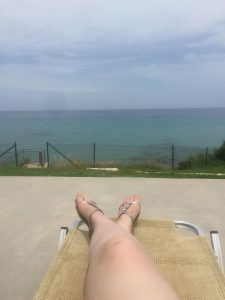 To effectively manage my health, there were times that I had to catch up on sleep instead of going out for the evening with our wedding guests who had come with us to spend the week in Greece, but I certainly don’t regret doing what I had to to make sure I was as healthy for the week and wedding day as possible. On the second evening, I went to bed early (8pm) and got over 12 hours sleep before catching up with people at breakfast the next morning. Some mornings I also slept in and instead of going for breakfast provided by the hotel, had a slightly later one in bed. It was great. Knowing when to slow down and take it easy is crucial in managing your health conditions and energy levels on holiday. There’s no shame in getting an early night or not pushing yourself to do more than you should, just because ‘you’re on holiday and should be making the most of it’. Some things I did have to plan ahead for was how I was still going to take a probiotic and all my supplements on holiday, when it wasn’t feasible for me to carry bottles of kefir (probiotic) and hundreds of tablets. As I take around 20 physical tablets a day, even trying to fit them in to a pill organiser would be difficult. So after speaking to my functional medicine practitioner, I bought the highest strength probiotic (at 100 billion) and a strong multivitamin that would replace many of the separate supplements I was taking. I was really thankful for her help in finding these as it put my mind at rest. The actual day of the wedding went really well for my health and I’m so so pleased to say that my health conditions didn’t get in the way at all. I didn’t think about them all day whilst the build up to my 6pm wedding was occurring, apart from some natural nerves prior to walking down the aisle. It went wonderfully smoothly. 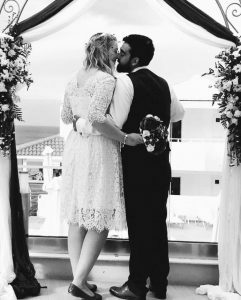 In September last year, when I first started seeing my functional medicine practitioner, I expressed to her how worried I was that I wouldn’t be well enough to properly enjoy the wedding and honeymoon and everything that came with it, but she promised me I would be. And she didn’t let me down. I was so pleased. After we got home on the Monday evening, I was back at work for a regular working week the next day and I actually did OK. I wasn’t overly tired, stressed or otherwise unwell, and despite having our UK wedding reception that weekend and then having to prepare to fly out for the honeymoon on the Monday, my health was absolutely fine. I’m starting to feel as if my health won’t be as much as a conscious thought as it used to be. Next week, look out for my blog on how I did in Asia, for the Honeymoon.